Call us about the current addition of this directory!!! The City of Chicago information listed below is just a sample of the information that can be found in our book! We have gathered the information that you need for over 400 municipalities ! Areas Covered in our Book! All information is updated with each new edition of the book! Below is a sample of what you will find in our new updated directory! The City of Chicago No longer uses Faxes! Current Chicago Building Code, building permits are required. 121 North LaSalle Street, 9th Floor Chicago, IL 60602. Bond is not required business license is required. E-Plans are used licensed architect stamp is required. Name of Inspector or officer who enforces this ordinance. Current Chicago Electrical Code (based on 2017 NEC). Electrical license and registration are required, bond is not required. Permits are required, amount varies. Plumber license is required, drain layers license is required. Bond required, permits required, fees required, fees vary. Call Chicago Sewer Dept. 312-744-3020. Backflow program is in effect. A Double Detector check Assembly (D.D.C.D.A.) or Detect Check (D.C.) backflow preventer is required on all fire protection system. (Reference Chicago Plumbing Code: 18-29-608.16.3). Phone: 312-747-9870. Best time to contact: 8:30 a.m. � 4:30 p.m., Monday � Friday. 2045 W. Washington, Chicago, IL 60612. 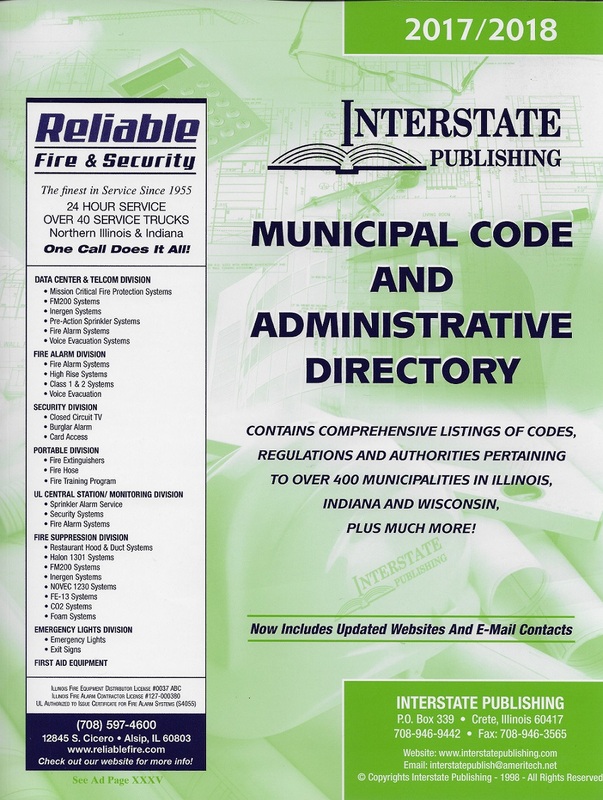 Chapter 15-16 of the Municipal Code of Chicago with some cross-references to NFPA 13 1994 edition. Stat license is required Permit and fees are required see Chapter 15-16. 121 North LaSalle St., Chicago, IL 60602. Pre-engineered fire suppression system employee municipal license is required for service on systems. Installation permits are required. Fee is $150.00 up to 4 story building, $750.00 over 4-story building. See revised fee schedule on building department site. Certificate of installation and inspection is required. Engineered fire suppression system company state license is required, and employee, municipal licenses is required for service on systems. Installation permits are not required. Certificate of installation and inspection is required. Functional test witnessed by the Fire Department is required. Fire alarms system company municipal electrical license is required. Installation permits are required. Certificate of installation or inspection is required. Monitoring is required for schools and institutions and some hotels and high rise buildings. 121 North LaSalle St., Room 905, Chicago, IL 60602.